As sports fans, we love going to games any chance we can get to catch our favorite team so it’s only natural that we would also love stadiums made of cake too. Check out these cakes that have been made for weddings, graduations, birthdays and other events. There are plenty more stadium cakes out there where these came from. Just search stadium cake in Google Images and you’ll be amazed at how many stadium cakes have been made. Unsurprisingly, there seems to be an abundance of cakes made for SEC football stadiums. University of Georgia’s Sanford Stadium in Athens, Gerogia by Cup a Dee Cakes. Penn State’s Beaver Stadium in State College, Pennsylvania by Piece A Cake. Yankee Stadium in Bronx, New York by Custom Cakes by Rose. Fenway Park in Boston, Massachusetts cake photo via Cake Central. AT&T Stadium, home of the Dallas Cowboys, in Arlington, Texas cake by Creme de la Creme. Texas A&M’s Kyle Field in College Station, Texas by Creme de la Creme. Old Trafford, home of Manchester United in Manchester England, photo via Cake Central. University of Michigan’s Michigan Stadium in Ann Arbor. Cake photo via MGO Blog. 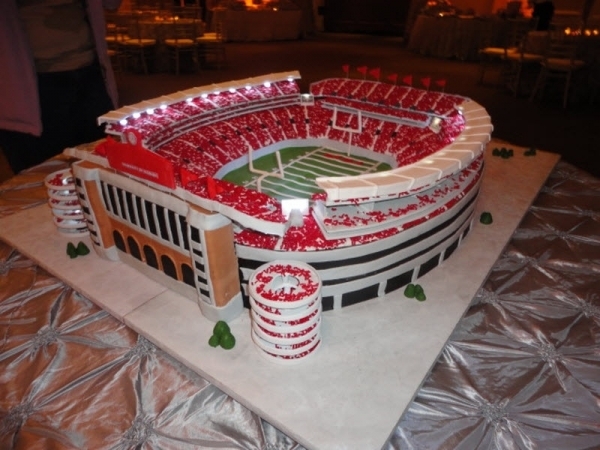 University of Alabama’s Bryant-Denny Stadium cake, via Cake Central. Arrowhead Stadium, home of the Kansas City Chiefs, by Sprinklebelle Cakes. Emirates Stadium in London, England, home of Arsenal Football Club, by Anne’s Cakes. Busch Stadium in St. Louis, via Pinterest.